Our friends Brice and Aline from France came in August to visit us at our home in Mukilteo, north of Seattle, and they wanted to go backpacking. So together we planned a series of trips into the wilds of western Washington starting with a short overnight backpack trip to Ptarmigan Ridge on the shoulder of volcanic Mt Baker. After that we car-camped a couple nights in the rain forest along the Hoh River in Olympic National Park, backpacked in for a couple nights at Foss Lakes in the Alpine Lakes Wilderness, and finally packed along the wild Pacific coast of Olympic National Park although we’d originally planned a longer trip deep into the wilderness of North Cascades National Park to Beaver Pass. Unfortunately, forest fires kept us out of the North Cascades. We hoped for good weather and lots of wildlife and weren’t disappointed except for smoke from the worst forest fires in decades that covered most of western Washington for weeks. Ptarmigan Ridge is a high rocky spine of Mt Baker, the glacier-covered volcano outside of Bellingham Washington. Our goal was hiking to Camp Kiser, a mountaineer’s base camp on the lower slopes of the volcano itself. Normally this area is under many feet of snow even in August, but this year record low snowfall combined with a hot summer left the route snow free all the way to Camp Kiser and above. The trail is almost entirely above timberline and as we started from the Artist Point parking lot it was hot and dry. Worse, smoke from forest fires in British Columbia had drifted down into the North Cascades Mountains so thickly that we could smell the burnt wood and the normally crystal clear view of Mt Baker just five miles away was lost in a thick haze of smoke. Even mighty Mt Shuksan, even closer than Mt Baker, was barely visible through the thick haze. And, it was crowded. Artist Point is a major viewpoint and there were dozens of day-hikers trudging up the trail to Ptarmigan Ridge. We had anticipated this and as we thought, very few people were packing in to camp overnight. By the time we reached Camp Kiser the crowds had dwindled to a trickle and we arrived at the rocky plateau of Camp Kiser to find we had the entire area to ourselves. We picked a flat area to camp in just steps away from Rainbow Glacier which would be our water supply with a steady dripping of glacier-melt providing us all the fresh, cold water we would need. The place was spectacular. Now that we were on the slopes of Mt Baker itself we could see through the smoky haze and the glaciers of Mt Baker spilled down off the mountain before us riddled with deep, blue-ice crevasses. A small herd of mountain goats rested in a meadow below us. The rest of the Cascade Mountains were barely visible through the thick smoke-haze, but we knew that the smoke would settle during the cool nighttime temperatures and we would have better views in the morning. But the hot, dry hike had taken its toll on us and we quickly set up our tents and laid down for a siesta, slightly heat-sick and dehydrated in spite of the two liters of water we had each consumed on the hike in. We got up in an hour or so, but just explored around the rocky plateau and cooked dinner while the sunset shone blood-red through the smoky sky before turning in early; saving our energy for exploring more the following day. The next morning the sun shone red through the smoky haze while valleys below us were socked in with thick smoke and fog. But as we hoped the sky above the low-lying smoke was blue and clear. We noticed that the rocky ridge above our camp was snow free so we filled our water bottles from the dripping glacier and set off to climb as high as we could on the slopes of the mountain itself following a steep trail worn into the rock from climbing teams making ascents of the mountain. 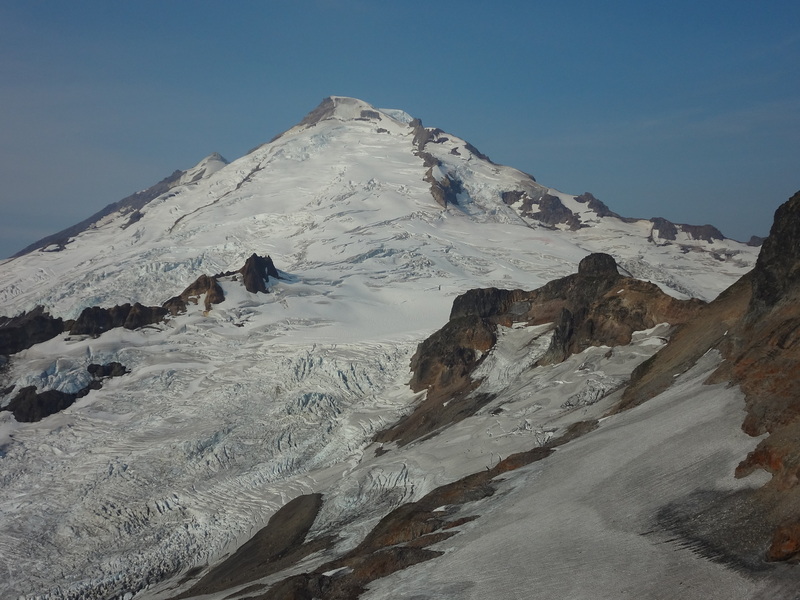 Amazingly we could follow the ridge all the way to its end; a spectacular rocky point that split the glaciers flowing off of Mt Baker into rivers of ice flowing below us and the peak of the volcano reaching into the blue sky above us. A small flock of ptarmigan in their mottled summer plumage were feeding on windblown seeds and insects a hundred yards away out on a glacier and a panorama of sharp, high mountains surrounded us dominated by the glacier-covered massif of Mt Shuksan just to the east. We could see the large glacier fields of Mt Challenger and the Boundary Peaks long the Canadian border. As afternoon heated the mountains the smoke started to rise from the valleys making the ranges of mountains in the distance stand out in dramatic silhouette. Brice had spotted a pool of water collecting in a small rocky basin a few hundred feet below our camp and we decided to hike down to it while Aline perched on a rock above us to take photographs. We slid down the gentle slopes of a glacier to the pool, the icy surface of the glacier now slushy in the hot sun, and stripped our clothes off to plunge in. But despite the heat of the day the water was ice cold and all we could manage was a quick “cowboy bath” splashing water on us as we waded into the pool. After that, back to camp to pack up and start the hot, dry hike back out. I was slow hiking out, Brice and Aline reached the parking lot an hour before me, but I saw more ptarmigan along the way including a mother with chicks and a fat one trotting down the trail in front of me. By mid-afternoon we drove down to the tiny town of Glacier for our traditional trip’s end meal of hamburgers and beer before driving the two hours back to Mukilteo. The next day we would leave for the Hoh River in Olympic National Park, so not much time to rest up before we made the five hour trip to the Pacific coast. This trip was a car-camp and my wife Sonia was coming too, so we packed Brice and Aline’s rental car, a small SUV, with our huge car-camping tent, cooler full of ham, cheese, watermelon and beer, lounge chairs, clothes, gas stove and cooking gear – the car was packed as if we were going on a safari and still we forgot to bring some things. I usually go backpacking which is much simpler and we had to stop at a WalMart along the way to buy some of the things we’d forgotten (like a warm blanket to sleep under). We took the ferry across Puget Sound from Edmonds to Kingston, then drove across the floating bridge onto the Olympic Peninsula and on through the small port city of Port Angeles and westward to the Hoh River, a long five-hour drive overall. Unfortunately the smoke from the forest fires that had plagued us on Mt Baker had drifted into Puget Sound and the normally clear views of Mt Rainier and the Olympic Mountains from the ferry were lost in the haze, but we knew it would be clear at the coast where ocean breezes sweep the smoke away. 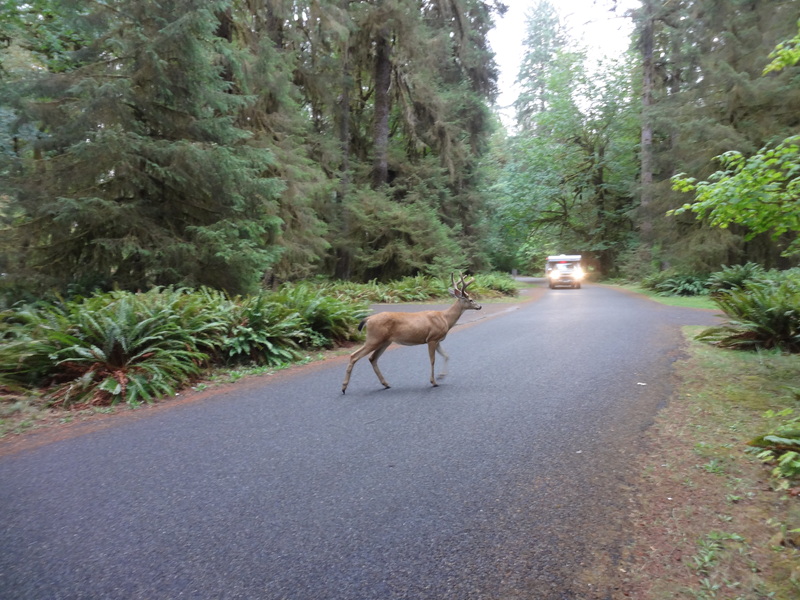 We arrived at the large campground at the Hoh River in late afternoon, hoping there was still a space we could get. There was and we quickly set up our big car-camping tent while Brice and Aline set up their backpacking tent and we set off for the short walk through the Hall of the Mosses by the visitor’s center. This short nature walk passes by huge old growth Douglass fir, western hemlock and Sitka spruce trees some reaching ten, twelve even fourteen feet in diameter and over two hundred feet tall. The large big-leaf maple trees and alders below these giants were draped with thick moss hanging from their limbs and forming fanciful shapes; a gnome here, a bear there, a mushroom shaped like Elvis. As evening fell we returned to camp for cold beer and hot quesadillas. As dusk fell a large owl flew past us to a tree nearby and we could see it was a barred owl, close cousin to the rare spotted owl. He dove to the ground catching a mouse as we watched from our picnic table and obligingly let us photograph him as he sat on a tree limb tearing the still squeaking mouse apart. We slept that night while he hooted loudly and some elk bugled their whistling calls down by the river. The next day we slowly walked along the mile or so Spruce Trail, returned to camp for lunch, and then set off up the Hoh River Trail which ultimately ends at Mt Olympus eighteen miles away. We saw our spotted owl friend again flying along the Spruce Trail but the highlight was walking along the sparkling Hoh River through a forest of gigantic spruce, fir and hemlock tree. It seemed impossible that a living thing could grow as large as these immense trees, some over fourteen feet in diameter and up to two hundred and fifty feet tall, and we never lost our wonder as we walked along. After a couple miles we turned around and walked back. We spent the night sipping brandy around the campfire after our dinner of toasted ham sandwiches until the rain that had been lightly spitting in the afternoon turned into showers and we retired to our respective tents. Now a pair of spotted owls had shown up and they hooted through the night to each other sounding ridiculously loud in the otherwise silent night. By early morning I woke to the raucous call of a gang of crows that had cornered one of the owls in a nearby tree and as I heated the morning’s coffee a deer silently crept close by, a young buck with his new antlers still in their velvety covering. Finally the owl made a break for it flying past our camp with a flock of angry crows close behind cawing and pecking at the fleeing owl. The wildlife show for the morning was over, but at least now it was quiet. The rain stopped and the sun came out as we packed the SUV to leave. We drove to La Push, a tribal town of the Quileute Nation outside of logging town of Forks. We ate breakfast in the restaurant at the marina in La Push watching seals and great blue herons fish in the Quileute River outside our window. A group of seagulls fed on salmon carcasses washed up on the shore while a bald eagle glided by following the river upstream. Even the restaurant made for great wildlife watching. We drove to Second Beach, a trail near the Quileute Indian Nation community at La Push on the Pacific coast, and hiked the easy ¾ mile trail through the forest to the beach. It was almost 80 degrees on the beach, very rare for this normally cool and rainy area, and there were hundreds of campers taking advantage of the good weather with tents set up among the driftwood logs for a mile down the beach. We strolled down the wide sandy beaches, waded in the surf and slept in the sun. As we left a bald eagle flew just thirty feet overhead with a baby crow clutched in its talons, the mother crow flying closely behind cawing frantically. We watched them fly down the beach until the eagle landed on a nearby cliff and began enjoying his meal while the mother crow flew away now that the situation was hopeless. 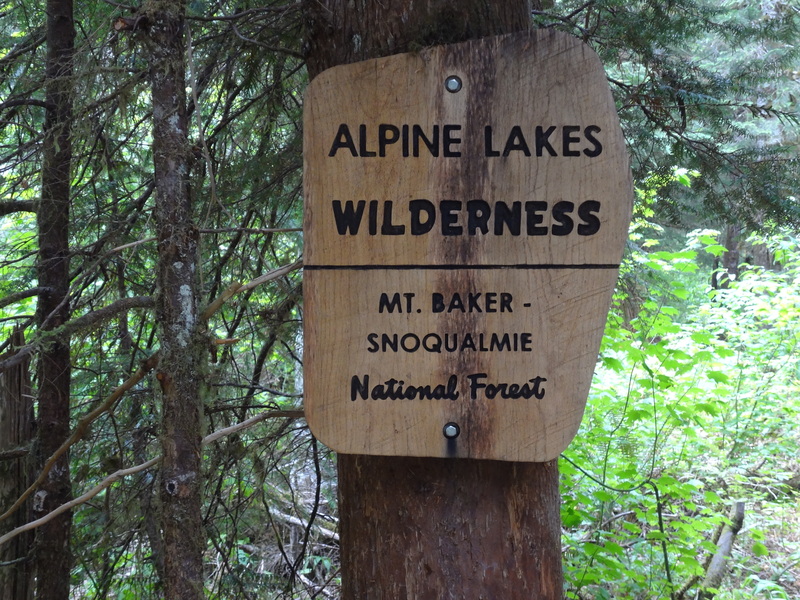 Time to start the long ride back to Mukilteo to rest up, clean up and prepare for the next trip into the wild; a two night backpack trip to a group of alpine lakes high in the Cascade Mountains. 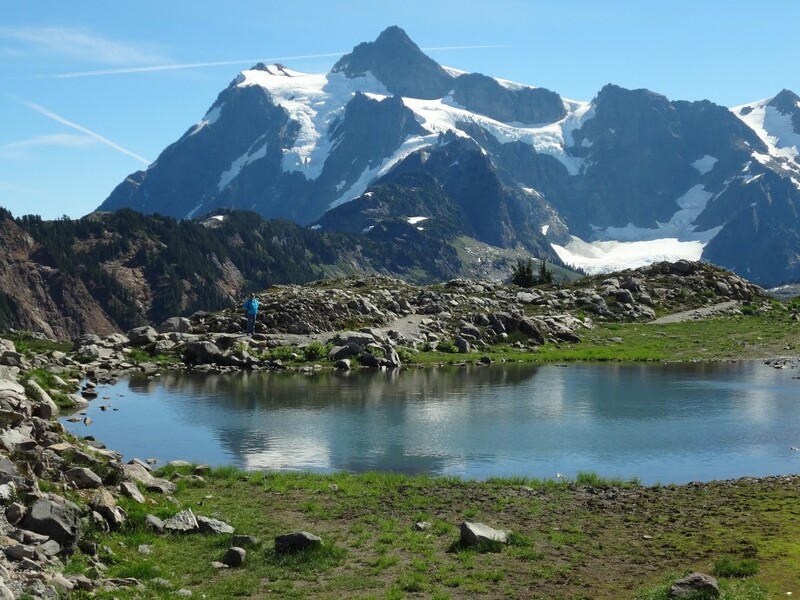 Foss Lakes is actually a series of alpine lakes each set in a deep “cirque” (a circular canyon formed by long-gone glaciers). They are deep, clear blue, usually cold and surrounded by forests. Since the trail up to them is only an hour outside of the city of Everett, just two hours from Seattle, we expected crowds. But the trail is also steep and strenuous gaining over 2,600 feet in elevation to the upper lakes and we were going in during the week, so hopefully it wouldn’t be too crowded. Brice, Aline and I set off from the trailhead as temperatures approached the mid-80s. The west fork of the Foss River that runs beside the trail was completely dry and we could smell the smoke from forest fires burning further north in the North Cascade Mountains and Canada. After an easy mile of walking we started climbing, first through groves of gigantic old-growth Douglass fir trees, then into steeper country and open areas of rock and brush. By the time we reached our goal, Little Heart Lake, we had each consumed close to three liters of water each and were still hot and thirsty. The air was slightly hazy from the forest fires burning far to the north but we could still see Bald Eagle Peak rising across the Skykomish Valley from us. After passing groups of day hikers and campers at the lower lakes we were surprised to find an excellent camping spot at Little Heart Lake and had the area to ourselves except for two guys camping further down the lake. Too tired for further exploration, we set up camp, cooked our dinners, and sipped our whiskey turning in early to save energy for exploring the upper lakes the next day. The evening cooled off, but I was still hot inside my goose down sleeping bag, so I slept on top of it instead of inside of it and took the rain fly off of my tent to watch the stars and the Milky Way through the mosquito netted tent frame. The next morning broke sunny and far less smoky. We had our coffee, packed our lunches, and set off for Big Heart Lake, just two miles away but higher up in the mountains. It was already hot by the time we started hiking, but the hike wasn’t too strenuous and we reached the upper lake within an hour or so. We found a large, flat slab of granite along the otherwise vertical cliffs of the lake shore and there we stayed for the afternoon. Brice and I took a short hike to explore the upper end of the lake, but returned to our picnic place on the rock where we ate our lunches. The normally freezing cold lakes were still cool, but perfect for swimming so we stripped off our sweaty clothes and dove off of the rock into the crystal clear water letting the sun dry us as we dozed on the warm rocks. It was a fine, lazy afternoon and we left reluctantly in the late afternoon back to our camp at Little Heart Lake two miles back down the trail. Another evening of relaxing in camp, cooking dinner, telling stories and sipping the remainder of our whiskey. We didn’t make campfires, the fire danger far too high and besides, I had quit making campfires in the back country decades ago – too dirty and smoky. We turned in early again. Even though the day hike had only been four miles, we were still tired from the heat and knew we had a steep hike back out. Although hiking up is tiring and aerobic, I find hiking back down to be more exhausting and stressful on the knees and feet since you are holding yourself back from sliding on rock and loose dirt and making big steps down off of rocks and tree roots. I wanted to rest up for the hike out. 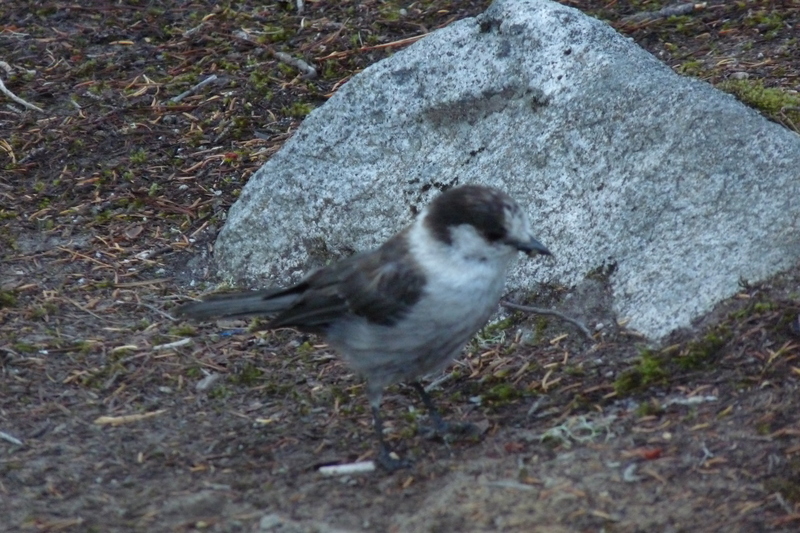 The next day I found that I had foolishly left the dried milk I use to cream my coffee in a plastic bag on the rock where we were cooking and a group of “camp robbers” (grey Canadian jays) were happily finishing up the last of it as I crawled out of my tent. We had hung the rest of our food in a nearby tree, safe from bears and camp robbers, but it was black coffee for me today. We hiked back out arriving at the parking lot by noon, drove out of the forest and back to Everett where we had our traditional trip’s end meal of beer and burgers. Despite the smoky skies it was a good trip. The swimming was great, but now time to prepare for our last backpack. Aline was flying back to France on Sunday, but Brice was staying five more days so that he and I could take a longer backpack trip into a particularly wild part of the North Cascades; four nights hiking in from Ross lake to Beaver Pass – but, as fate would have it – that wasn’t to be. Brice and I planned pack into a particularly wild part of North Cascades National Park, Beaver Pass, but the severe forest fires in Washington and Canada had produced heavy smoke across much of western Washington. Then the fires became so severe that highway 20 which we would use to reach the trails was closed and finally backpackers were being evacuated from the area we were heading towards, so we changed our plans. Instead we planned a trip into Mt Rainier National Park and packed for a four night trip into the back country around Mystic Lake. But upon arriving at the Sunrise Visitors Center on the flank of The Mountain itself the forest fire smoke was so sever it choked us and the mountain wasn’t visible even though at Sunrise we were on the actual flank of it; time for emergency reconsideration. Knowing that at least the Pacific Coast would be clear of smoke we decided to drive the seven hours from Mt Rainier to Lake Quinault in Olympic National Park and then backpack up the North Coast Wilderness along the northernmost coastline of the conterminous United States where seventy miles of rocky beaches, dramatic “sea stacks” (spires and islands of rock protruding out of the ocean) and tide pools are protected as wilderness. After a grueling day of driving first to Mt Rainier, then all the way to the Olympic coast we drove north of Lake Quinault, found a spot along the Quinault River to set up our tent as evening arrived. We settled in for the night exhausted but under blue skies at last – we had finally escaped the heavy layer of smoke covering most of western Washington. The next morning we stopped in Quinault and picked up our wilderness back country permit, a “bear can” (a small lockable drum required for camping along the coast to discourage pesky raccoons), a contour map of the wilderness area and a tide table. We took the short walk to see the world’s largest Sitka spruce tree before making the hour and a half drive to Rialto Beach on the Pacific coast where we would start our trip. Cliffs protrude into the ocean along the North Coast Wilderness that block travel up the beach. Called headlands these cliffs have to either be walked around at low tide, or crossed over using short but steep trails. There are a few headlands that don’t even have trails over them, so we could get stuck along the coast if we arrived at these headlands at high tide. We would be keeping a close eye on the tides for the next few days. Once at Rialto Beach we shouldered our packs and started walking up the mile and a half flat, sandy beach to the first rock formation, Hole-In-The-Wall, a dramatic headland with a large, cave-like opening that you can walk through at low tide. 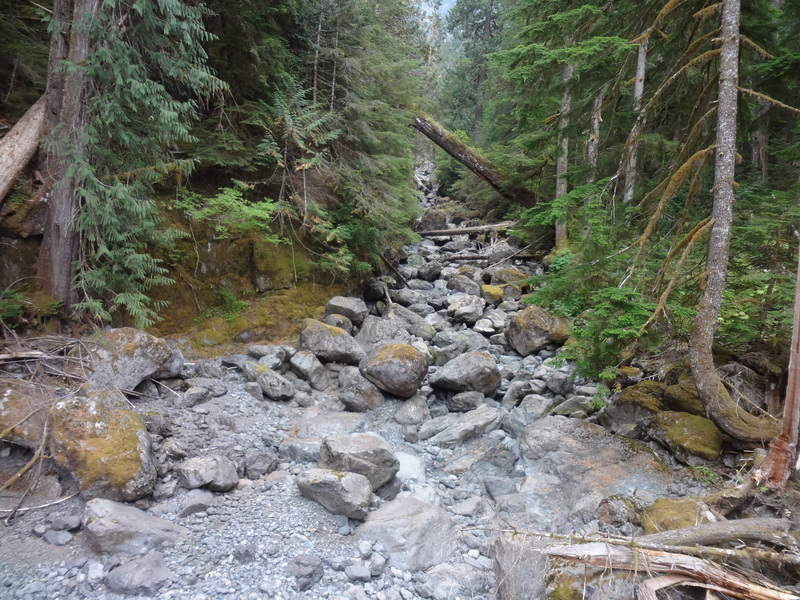 Along the way I noticed the normally reliable freshwater stream, Ellen Creek, was dry. This was very unusual and a bad sign – finding fresh water to drink was going to be difficult. Backpacking along this section of coast isn’t as easy as it sounds, in fact it can be strenuous. There are some long sandy beaches where the walking is reasonably easy, although slogging through the soft sand with a full pack can get exhausting. But other sections are rocky headlands and cliffs that keep you hemmed in between slippery, seaweed covered rocks and the pounding surf just below. In places you have to rock-hop through boulder fields. Then there’s water and tides. There aren’t many places where fresh water trickles down from the cliffs and you have to be careful where you camp so that incoming tides don’t catch you between the cliffs and the surf and wash you away. And this year was a severe drought with many of the fresh water sources dried up. And, it was hot. Strange for the cold, northern coast but it had been a dry, hot year in Washington State and even along the normally cool coastline it was eighty degrees Fahrenheit. We hiked six miles up the coast arriving at a no-name bay with a sandy beach and a fine trickle of fresh water pouring from the cliffs at our backs. We had the whole bay to ourselves. Just north of us was an impassable headland. To cross it we would need to climb a short but steep trail even at low tide, so we found a sandy flat spot above the high tide level among the huge driftwood logs lining the beach and set about making camp for the night. Tired from scrambling over slippery rocks and crawling through blown-down trees and driftwood logs we settled in, cooked our freeze dried dinner and sipped our whiskey while watching the sun set over the Pacific. A string of rocky reefs a half mile offshore broke up the bigger waves rolling in from the Pacific and our beach was gently washed by a low, calm surf rhythmically washing up on the sand. A curious sea lion swam by a hundred meters out in the surf and watched us for the next hour or so, bobbing in the surf and popping his head up out of the water to keep an eye on us. As the sun set over the Pacific a bald eagle cruised by overhead, a great blue heron croaked his unusually loud throaty call from his perch somewhere in the cliffs behind us, and we could hear other sea lions barking on the rocks a quarter mile off shore from us. Brice took a walk down the beach at dusk and soon after he left a group of three otters swam past our camp just a couple meters off shore in the surf. At first I thought they may be sea otters, but they were river otters which sometimes live along salt water areas. A few minutes later one of them swam back, crawled out of the ocean fifty meters below our camp, and scampered across the beach to the forested cliffs nearby. It happened so fast I didn’t have time to get a photo and when Brice returned he was disappointed he had missed seeing the otter. But he didn’t have to worry – they’d be back. We slept soundly on our bed of soft sand with the surf gently washing along the beach and the morning broke clear and sunny. Today we would hike a few miles north to a sandy point, the Norwegian Memorial so named for a shipwreck that occurred in 1903 in the reefs in this area which is known as the Graveyard of the Pacific because of the many shipwrecks that have occurred here. We even found the rusty old iron rigging ring from a sailing ship’s mast lying in the sand further south along the beach. We crawled up over the headland above our camp using a rope hanging down from the cliff to find a wide, flat sandy beach on the other side. From there it was an easy walk along flat, sandy beaches for the next couple miles to the Norwegian Memorial. We stopped to explore the remains of the Starbuck Mine, a turn-of-the-century gold mine, but just a few pieces of rusty equipment were left, covered in moss and disintegrating into the forest. A family was camped in the forest at the memorial, the first people we had seen since the previous afternoon. We lounged on the driftwood logs at the beach, ate our lunch of crackers, cheese and sausage, and by mid-afternoon started back for our quiet bay and camp. Back at camp we relaxed. The next day we’d hake back out to Rialto and we knew we would have to scramble through a lot of rock to get there. As evening arrived a young woman, Mora, hiked by barefoot and stopped to talk to us. After explaining to her that fresh water was scarce south of our little bay she decided to camp along with us and strung her hammock from a large driftwood log nearby. We cooked our dinners as the sun set and then, as dusk arrived, two otters came scampering down the beach just fifteen meters in front of our camp. Again I didn’t have time to get my camera before they jumped into the surf and swam away, but at least Brice had been able to see them this time and snapped a quick photo as they swam by. Satisfied with having had such a great wildlife sighting we crawled into our sleeping bags as the stars came out. Last morning along the coast. We knew we were going to be stopped from hiking out early due to a high tide at Cape Johnson, a particularly difficult headland to pass with no trail over it. So while Mora packed up had started off early, Brice and lounged in camp sipping our morning coffee and slowly packing up for the hike out. 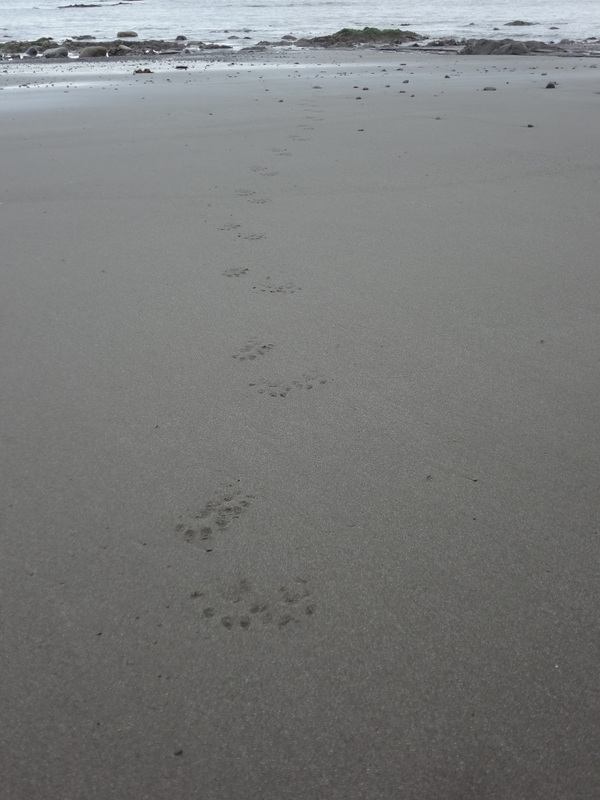 As we packed we noticed sea otter tracks all through our camp and remembered the little rustling noises we had heard in the night – they must have checked us out. We hiked a mile and a half down the beach to Cape Johnson and as we expected, it was impassable with the surf pounding against the sheer cliff face. We sat on a huge driftwood log just above the cliff face eating an early lunch and waiting for the tide to start going out enough to scramble through the slippery rocks. A pair of bald eagles flew by and landed in nearby trees keeping a close eye on us. After an hour and a half the tide had dropped enough to attempt the crossing and we set off through the driftwood logs and jumbled piles of rocks. The rocks at the cliff face were step and slippery and the surf was still washing over them at places. Brice lid off a steep, smooth rock into the surf at one point but was able to quickly scramble out although he was soaked up to his waist. I managed to jump across some rocks in between the waves that were washing over them and we soon made it to dry rock above the tide line. The rest of the hike out was easier, though we still had some long stretches of boulder hopping and crawling over, under and around blown down trees and a few more short sections of slippery, seaweed covered rocks. Finally we reached the sandy beaches above the Hole-In-The-Wall and Brice took off his boots to walk the last few miles barefoot along the beach. Once again we were able to walk through the Hole-In-The-Wall since the tide was now low and stopped to admire the lime-green sea anemones in the tide pools there. But no starfish – not one. Over the past few years starfish along the Pacific coast have been dying off in massive numbers – scientists aren’t sure why. The tide pools along the Olympic coast are usually filled with purple, orange and red starfish, but now they’re empty of them. We walked the flat sandy beach to the parking lot at Rialto Beach admiring the pelicans sailing along the coast and diving into the ocean. And now, the long, long drive back to Mukilteo. 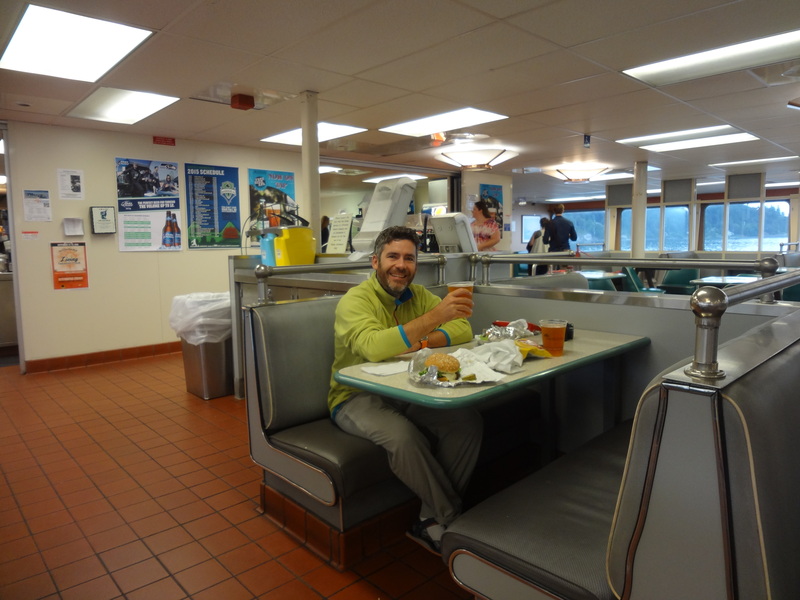 We had our traditional trip’s end burger and beer on the ferry ride across Puget Sound from Kingston to Edmonds. We were disappointed we couldn’t have packed into the North Cascades as we had originally planned, but who could complain about the wild, Washington coast in sunny weather and with sea otters running past camp to boot. Time to dream and plan our next wilderness excursions.